I've been told that Pillow Pets are all the rage right right now. At the store you can buy one for around $20, but they are small- I don't think I could lay my head on it and be comfortable, so for Christmas I made pillow pets for my niece and nephews. I found a great tutorial at Twelve Crafts Till Christmas. She made everything from scratch... body, tail, and head. I really didn't want to go that route because lets face it, I'm lazy. SO, I went searching around the web and found another great tutorial on All Things Shea. She cut up a stuffed animal and sewed it to a pillow. So I took both those ideas and meshed them together and made my version of the pillow pet. I didn't take pictures of the process because the tutorials mentioned above are really all you need to make the pillow pets. 1. Cut the head and tail off the stuffed animal. Then wash them in a pillow case, so the stuffing doesn't get everywhere. 2. Follow the tutorial found HERE. Follow the tutorial, but instead of leaving a head hole, leave a small opening on the side opposite of the fleece strip. 3. Turn right side out and sew the head on. I had to stuff the pillow a little bit, so I could get the placing just right, then I sewed the head on by hand. Make sure it is secure and looks good before stuffing the pillow. Refer to this tutorial HERE. 4. After you stuff the pillow, sew the little opening up by hand or machine. Now you got yourself a pillow pet. 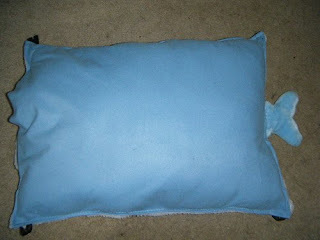 Side view of pillow when it is a "pet". Face of the pillow pet. Top view of the pillow pet when it is a "pillow". The kids with their pillow pets. I made a monkey (not pictured), dog, cat, tiger, and elephant. Only stuffed animals were harmed in the making of these Pillow Pets.